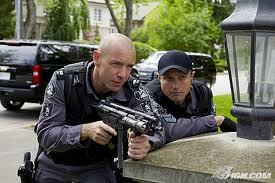 Flashpoint is one of my favorite television shows. Within the last month was a fairly intense episode where an officer was shot six times at near point blank range in the chest. Luckily, he had his vest on (thank goodness because he is my favorite character) and suffered some gunshot wounds to the arms but was otherwise in good shape. Off to the ER he goes. Nice… if you want to kill your patient. The issue with morphine is that it is prepared in multiple concentrations. The lowest concentration is 1mg/ml. In this scenario, the patient would have received 10mg of morphine which would have been okay. Most often you’ll see smaller doses titrated up for pain control. On our unit, we have two concentrations of morphine: 2mg/ml and 4mg/ml. I know I have very smart readers so you can see the potential problem. The physician ordering 10ml without specifying the concentration means this patient could either get 20mg or 40mg of Morphine. These are both potentially lethal doses and would have put our fine character in serious trouble. The morphine dose should have been ordered in milligrams not milliliters. Drugs are rarely, if ever, just ordered in milliliters. Be careful with drug dosing. You don’t want to accidentally kill off a character you want to have around for awhile… or do you?